A pair of tickets is up for grabs for this year’s Southdowns Folk Festival which is billing itself as “bigger and even better” as it prepares to hit Bognor Regis from September 23-25. Organiser Roger Nash said: “The tickets will get you into five superb concerts at the town’s Alexandra Theatre and Regis Centre Studio featuring some of the UK’s and Europe’s top folk, roots and acoustic performers. “Starting with the amazing Cara Dillon and band on Friday evening, the studio concerts on Saturday afternoon feature the brilliant Dutch band Wild Geese and Scottish singing sensation Claire Hastings and in the evening, the awesome Oysterband supported by the excellent Fate the Juggler. Open to all musicians aged eight to 21, the competition will take place at the William Hardwicke on Sunday, September 25. The winner will receive a new guitar and be awarded with a 20-minute set later the same day, supporting the festival’s headliners in the Alexandra Theatre. Roger is delighted with the way the programme has come together – particularly with the late addition of Martin Carthy after Shooglenifty were forced to withdraw from the festival for personal reasons. “This is our fourth festival, and for the fourth festival we are focusing the festival much more on Bognor Regis town centre. We are not using Hotham Park. “We just want to be more central this time. 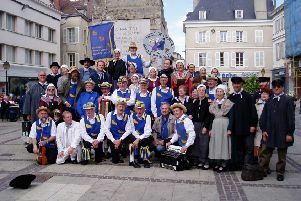 We have linked up with the town-centre management, and we have got nine different dance groups performing. We have also got music sessions going on and workshops going on, and we have also got the Sussex Young Folk Competition at the William Hardwicke and a real-ale festival. Roger is delighted at the way word has spread for the festival since he revived it after many years away: “We are doing the social more media actively than before, and it does make a big difference because it gets the message out much more widely. It is as simple as that. Just as importantly, Roger is delighted at the important knock-on economic benefits it brings to Bognor and the positive image it helps to project of the town as a lively, successful place. To win a pair of weekend tickets for the 2016 Southdowns Folk Festival, email phil.hewitt@chiobserver.co.uk giving your name, address and day-time phone number and putting Southdowns Folk Festival in the subject line or write to Southdowns Folk Festival, c/o Phil Hewitt, Chichester Observer, Suite 3, First Floor, City Gates, 2-4 Southgate, Chichester, West Sussex, PO19 8DJ. Entries to be received by midnight on September 15. Only the winners will be contacted.